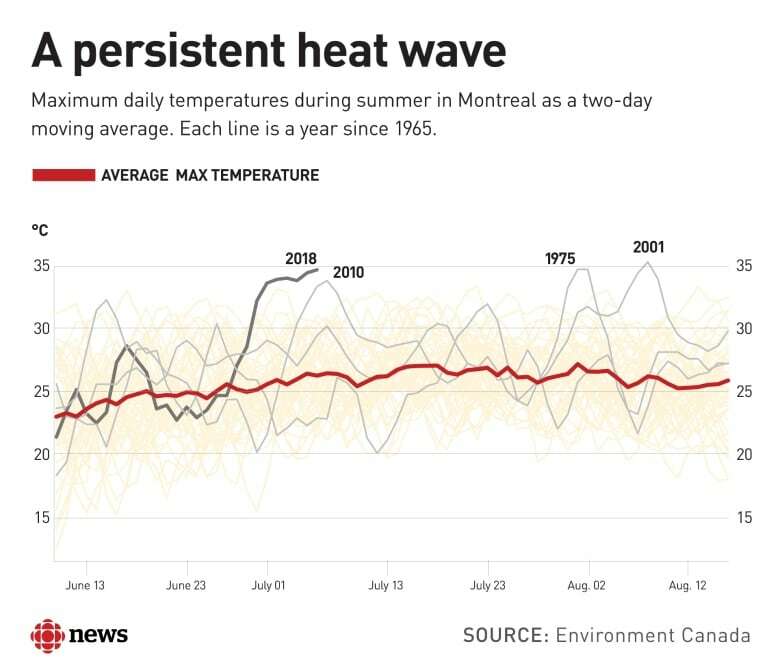 At least 54 people have died in the past six days, possible victims of a heat wave that consumed southern Quebec and saw temperatures in the mid to low 30s for nearly a week. According to the province's Health Ministry, 28 of those deaths were in Montreal, 10 more than were reported Thursday. Environment Canada lifted the heat warnings that had been in place in the province for several days, although temperatures are expected to climb back up to 29 C on Sunday and Monday. According to Environment Canada's Serge Mainville, the weather will be much less humid than during this week's hot spell. "The higher temperatures and humid Sunday and Monday will mostly affect southern Quebec," Mainville said. Despite the milder weather, emergency responders from Urgences-Santé will have a higher number of paramedics working than usual. Thursday's temperature reached a high of 34 C, which led to a higher number of 911 calls for paramedics, according to Urgences-Santé spokesperson Valérie Tremblay. "For the paramedics and the dispatchers, it's very hard work," she told CBC News. She said paramedics responded to 1,378 calls Thursday, about 30 per cent more than the average. Montreal public health officials are continuing door-to-door checkups today, and will be targeting the most vulnerable clients, according to the regional director of Montreal's public health department, Mylène Drouin. "We're going to visit several rooming houses and possibly old folks' homes to see how men are recovering," Drouin said. About 60 per cent of those who died in Montreal were men living alone. None of them had air conditioning at home, and all of them lived in buildings with many storeys, Drouin said.